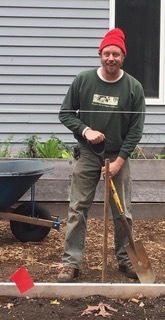 Maurice (Reese) Crotteau joined Pumpkin Brook in 2014 as a Crew Supervisor and quickly proved his worth in many arenas: fine garden maintenance, woody plant transplanting, pruning, permaculture garden expansion, and vegetable garden construction projects. Reese is a graduate of Sterling College with a degree in Sustainable Agriculture and Wildlands. He first worked on a private estate in southern New Hampshire, routinely transplanting trees and shrubs and managing their care as Nursery Manager. He has worked also as a Vineyard Manager and Field Manager on an organic farm. In addition, Reese has many years of work experience all over New England in timber frame carpentry. He is our go-to man for designing and building unique garden structures. In 2018 Reese joined our Plant Health Care department as a Technician. We are delighted to promote him this season to Plant Health Care Manager. We're happy to talk with you about tick and mosquito control, organic gardening and more! 15 minutes — free of charge. When you sign up for the monthly newsletter, you'll receive the coming month's To-Do list to help keep you on track for a beautiful garden, year round. © Copyright 2015 Pumpkin Brook Organic Gardening, Inc. All rights reserved.